Map of the division of the states during the American Civil War. 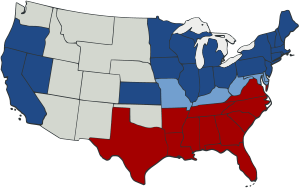 Blue (the U.S. Army's uniform color) indicates the Union states; light blue represents Union states that permitted slavery (border states). Red represents states in rebellion, also known as the Confederate states. Uncolored areas were U.S. territories. The flag of the United States of America from 1861 to 1863. The southern states were still represented in the number of stars in the flag because the Confederacy's declaration of secession from the Union was still considered illegal by the United States. In 1863, a star was added to represent the new state of West Virginia. The war years were quite prosperous except where serious fighting and guerrilla warfare took place along the southern border. Prosperity was stimulated by heavy government spending and the creation of an entirely new national banking system. 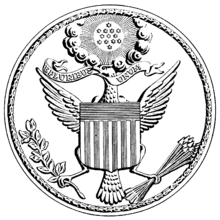 The Union states invested a great deal of money and effort in organizing psychological and social support for soldiers' wives, widows, orphans, and for the soldiers themselves. Most soldiers were volunteers, although after 1862 many volunteered to escape the draft and to take advantage of generous cash bounties on offer from states and localities. Draft resistance was notable in some larger cities, especially New York City with its massive anti-draft riots of 1863 and in some remote districts such as the coal mining areas of Pennsylvania. In the context of the American Civil War, the Union is sometimes referred to as "the North," both then and now, as opposed to the Confederacy, which was "the South." The Union never recognized the legitimacy of the Confederacy's secession and maintained at all times that it remained entirely a part of the United States of America. In foreign affairs the Union was the only side recognized by all other nations, none of which officially recognized the Confederate government. The term "Union" occurs in the first governing document of the United States, the Articles of Confederation and Perpetual Union. The subsequent Constitution of 1787 was issued and ratified in the name not of the states, but of "We the People of the United States, in Order to form a more perfect Union ...". Union, for the United States of America, is then repeated in such clauses as the Admission to the Union clause in Article IV, Section 3. Even before the war started, the phrase "preserve the Union" was commonplace, and a "union of states" had been used to refer to the entire United States of America. Using the term "Union" to apply to the non-secessionist side carried a connotation of legitimacy as the continuation of the pre-existing political entity. 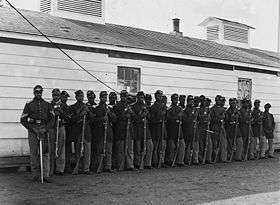 Confederates saw the U.S. as being opposed to slavery and occasionally referred to them as abolitionists, as in reference to the U.S. Navy as the "Abolition fleet" and the U.S. Army as the "Abolition forces". In comparison to the Confederacy, the Union had a large industrialized and urbanized area (the Northeast), and more advanced commercial, transportation and financial systems than the rural South. Additionally, the Union states had a manpower advantage of 5 to 2 at the start of the war. 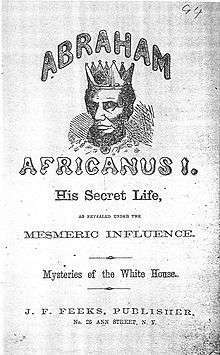 Historians have overwhelmingly praised the "political genius" of Abraham Lincoln's performance as President. His first priority was military victory. This required that he master entirely new skills as a strategist and diplomat. He oversaw supplies, finances, manpower, the selection of generals, and the course of overall strategy. Working closely with state and local politicians, he rallied public opinion and (at Gettysburg) articulated a national mission that has defined America ever since. Lincoln's charm and willingness to cooperate with political and personal enemies made Washington work much more smoothly than Richmond, the Confederate capital, and his wit smoothed many rough edges. Lincoln's cabinet proved much stronger and more efficient than Davis's, as Lincoln channeled personal rivalries into a competition for excellence rather than mutual destruction. With William Seward at State, Salmon P. Chase at the Treasury, and (from 1862) Edwin Stanton at the War Department, Lincoln had a powerful cabinet of determined men. Except for monitoring major appointments and decisions, Lincoln gave them free rein to destroy the Confederacy. In the first few months, men wore low quality uniforms made of "shoddy" material, but by fall, sturdy wool uniforms—in blue— were standard. The nation's factories were converted to produce the rifles, cannon, wagons, tents, telegraph sets, and the myriad of other special items the army needed. 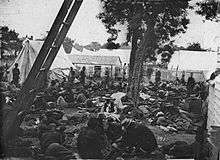 The hygiene of the camps was poor, especially at the beginning of the war when men who had seldom been far from home were brought together for training with thousands of strangers. First came epidemics of the childhood diseases of chicken pox, mumps, whooping cough, and especially, measles. Operations in the South meant a dangerous and new disease environment, bringing diarrhea, dysentery, typhoid fever, and malaria. There were no antibiotics, so the surgeons prescribed coffee, whiskey, and quinine. Harsh weather, bad water, inadequate shelter in winter quarters, poor policing of camps, and dirty camp hospitals took their toll. 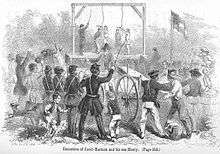 This was a common scenario in wars from time immemorial, and conditions faced by the Confederate army were even worse. What was different in the Union was the emergence of skilled, well-funded medical organizers who took proactive action, especially in the much enlarged United States Army Medical Department, and the United States Sanitary Commission, a new private agency. Numerous other new agencies also targeted the medical and morale needs of soldiers, including the United States Christian Commission, as well as smaller private agencies, such as the Women's Central Association of Relief for Sick and Wounded in the Army (WCAR), founded in 1861 by Henry Whitney Bellows, a Unitarian minister, and social reformer Dorothea Dix. Systematic funding appeals raised public consciousness as well as millions of dollars. Many thousands of volunteers worked in the hospitals and rest homes, most famously poet Walt Whitman. Frederick Law Olmsted, a famous landscape architect, was the highly efficient executive director of the Sanitary Commission. ↑ Stampp, Kenneth M. (1980). "The Concept of a Perpetual Union". The Imperiled Union: Essays on the Background of the Civil War. p. 30. ↑ The war of the rebellion: a compilation of the official records of the Union and Confederate armies. 1. 14. pp. 185–1,015. Retrieved March 19, 2016. ↑ Gary W. Gallagher (2001). 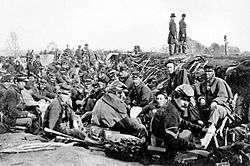 The American Civil War: The War in the East 1861 – May 1863. Osprey Publishing. p. 22. ↑ Nevins, Allan (1959). The War for the Union: The Improvised War 1861–1862. pp. 74–75. ↑ McClintock, Russell (2008). 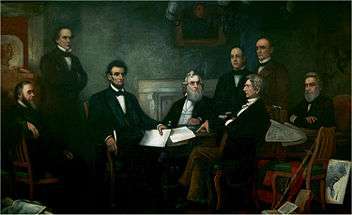 Lincoln and the Decision for War: The Northern Response to Secession. p. 255. Pages 254–74 provide details of support across the North. ↑ Paludsn, Phillip Shaw (1994). The Presidency of Abraham Lincoln. pp. 21–48. ↑ Steven E. Woodworth (2011). This Great Struggle: America's Civil War. Rowman & Littlefield. p. 311. ↑ Jonathan W. White (2014). Emancipation, the Union Army, and the Reelection of Abraham Lincoln. LSU Press. p. 116. ↑ Adrian Cook, (1974). 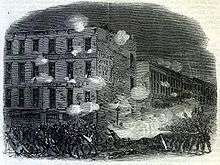 The Armies of the Streets: The New York City Draft Riots of 1863. University Press of Kentucky. ↑ Nevins, Allan (1959). War for the Union: Vol 5. The Improvised War, 1861–1862. p. 235. ↑ Gallman, J. Matthew (1994). The North Fights the Civil War. pp. 56–73. ↑ Michael Perman and Amy Murrell Taylor, eds. (2010). Major Problems in the Civil War and Reconstruction. Cengage. p. 178. ↑ James Ford Rhodes (1904). History of the United States from the Compromise of 1850: 1864–1866. Harper & Brothers. pp. 507–8.